Here are explanations of some terms commonly used to describe bicycle racing. · Blue band - or "cote d' azure"
The stoker is the rider on the rear seat of a tandem. Although this is sometimes referred to as the power position, that does not necessarily mean that one rider is working any harder than the other. Since the rear rider’s position has a more direct connection to the rear wheel, a smaller percentage of his or her power output is lost in the mechanical inefficiencies of the bike. The rider on the front seat of a tandem bike who is often also referred to as the driver or pilot. Tandem teams are usually classified in three gender categories. Men’s: two male riders. Women’s: two female riders. Mixed: one male and one female rider; there is no distinction based on which one is driving. 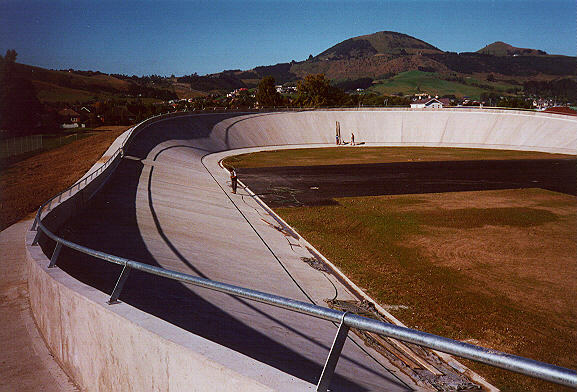 A steeply banked, oval-shaped track designed for bike racing. They are built in a variety of sizes, with lap distances ranging from around 160 meters to 500 meters. The two most common lengths are 250 meters and 333.33 meters. Long tracks, 333 meters and longer, most frequently have concrete surfaces whereas short tracks are most often made of wood. A typical 333 meter track will have somewhere between twenty-eight and thirty-five degree banking at the apex of the turn. However, a 250-meter track will likely have somewhere between forty-two and forty-eight degree banking. The steeper the banking the faster one must ride in order to keep from sliding off the track. There are fewer than two dozen operational bike tracks left in the United States today. Prior to World War II, there were several hundred. 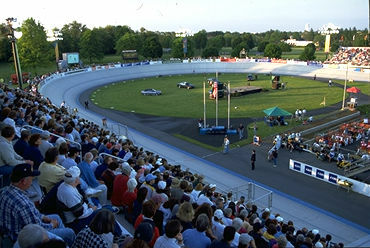 In Europe and Australia, track racing is much more popular and there are many more velodromes. Also known as a fixed-gear bike, it is designed to be lightweight and efficient. There is only one gear on the bike; many people would call it a one-speed. There is no free-wheel action built into the drive train. So, if the rear wheel is rolling, the pedals must be moving two. Thus, if you were to pedal backward, the bike would move backward. A track bike has no breaks. The rider slows the bike by applying backward pressure on the pedals. This prevents rapid deceleration while racing on the velodrome where riders are often bunched together in tight packs. Track racers need to choose what gear they will use in a race before getting on the bike to race. Gear selection is an important aspect of race strategy. To change the gear, the rear wheel must be removed. Blue band - or "cote d' azure"
The 20-centimeter wide band of blue paint at the bottom edge of a velodrome surface. It's out-of-bounds at anything but the slowest of speeds. This is the lowest line on a velodrome surface. Also referred to as the pole line or measurement line, it is the line that determines the measurement of the track. For example, a 250-meter track is 250 meters when measured at the pole line. This line also marks the inside edge of the pole lane (the sprinters lane). Painted one meter above the black line on the velodrome surface, this line marks the outside edge of the pole lane (sprinter's lane). Once a sprint is fully engaged (riders are near top speeds), and a rider enters the pole lane, the rider is not allowed to leave the lane (ride above the red line) to attempt to impede the progress of his or her opponent. This is the blue line painted in the middle of the velodrome surface. It is also known as the stayers’ line. Slow-moving riders in training and relief riders in the madison race are required to stay above this line. This is a velodrome race that is often thought of as the ultimate test of a rider’s speed and strength. Competitors try one by one to cover 1000 meters (four laps on a 250 meter track) in as little time as possible. Depending on the rider’s strengths and weaknesses, basic strategies range from blasting off the line with a brutally quick start, reaching top speeds in less than a lap and then holding on for dear life as the pain sets in, to delivering a smooth metered starting effort followed by constant acceleration for four laps. This velodrome race is a very strategic and technical event that involves two bikes stalking each other for approximately 1,000 meters at low speeds as they intensely watch for the perfect opportunity to surprise their opponent with an explosive acceleration. The remaining distance is an all out high-speed sprint to the finish line. Since only two bikes race at a time, sprint tournaments consist of multiple elimination rounds. Championship formats are never single elimination; a rider must lose more than once to be kept from advancing. Riders are seeded in a tournament's start list based on a qualifying ride. The standard qualifier is a flying 200-meter time trial. Two bikes start on opposite sides of the velodrome and chase each other for a given distance. If one rider catches the other before they have gone the full distance, the race ends immediately. The race goes the full distance if neither rider catches their opponent, and is won by the rider who covers the distance in the least amount of time. Like match sprints, since only two bikes race at a time, riders compete in a tournament format. Unlike match sprints, the tournament format consists of single elimination rounds. Women and mixed tandem categories ride 3000 meters whereas men's competition covers 4000 meters. Each rider attempts to cover a specified distance in the minimum amount of time. Riders are assigned start times and ride by themselves; drafting is not allowed. Any race where multiple riders come to the same start line all at the same time. This contrasts with individual events, such as time trials, or the pursuit where two riders start at two different start lines. Mass start events are common in all forms of bike racing: road, track, and off-road. A long distance mass start event on the road. Sometimes, riders will race multiple times around a several mile course (a circuit race). Other times they will race once around a very long loop. Or, they may race from one point to another (a point-to-point course). Elite and pro men’s courses are rarely shorter than eighty miles and are more often over a hundred. Elite or pro women’s races are rarely shorter than 50 miles and are commonly sixty-five to ninety miles. A road race conducted on a very short circuit, usually in the neighborhood of 0.7 to two miles. They are often run around a few city blocks and have several corners. They tend to be flatter and shorter than other types of road races. They are often very technical from the bike handling perspective because of the frequent cornering. Total distances range widely from ten or fifteen miles to fifty or so. A series of consecutive road events grouped together into a single large competition. Small stage races may be held over two or three days and have only a few stages. Very large stage races, like the Tour de France, span several weeks and may incorporate a few rest days. There are usually a variety of types of stages, including road races, time trials, and sometimes criteriums. Each stage is timed and the overall winner will be the rider with the fastest total time. Also known as sitting-on or grabbing a wheel, one rider rides in the slipstream of another, protected from the wind. This usually means riding very close together, often with wheels only a few inches from one another. Drafting can reduce required energy expenditure by as much as thirty percent. This fact is one of the major factors in racing strategy.